Isoflurane (and sevoflurane) gaseous anesthetics are very well tolerated by chins – much more so than Halothane. When possible request that your vets uses either one. Ensure your chin is well-hydrated before the operation – as this can lessen the risk of adverse effects. 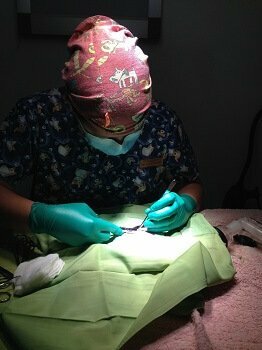 There is no need to starve a chinchilla before an operation. When you drop the chinchilla off at the vet’s, take some of the usual food in – just in case the chinchilla needs to stay overnight. It sometimes helps to write any special instructions down – so the veterinary nurses are aware of any unusual requirements while the chin is in their care. Within the first few hours of getting a chinchilla home after a surgical procedure of any kind, I recommend the following. Ensure the chinchilla is eating within a few hours – to prevent eventual anorexia. Encourage the chinchilla to do so by offering favorite foods (but not too many treats). Keep the chinchilla as stress-free as possible by minimizing handling and providing a nestbox (or similar) as a retreat. Ensure the chinchilla is in an area where there are peace and quiet. Make sure the chinchilla drinks – a little pure apple or pineapple juice can be added to the drinking water to encourage drinking. Metacam can be prescribed by the vet if extra pain relief is required – or you can give Calpol 6+ (see “First Aid Kit Contents” for correct dosages). However, please liaise with your vet first as an analgesic injection may well have been given – which can be effective for a couple of days. 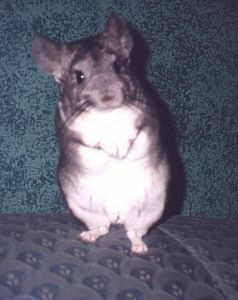 An oat and wheatgerm mix can be given to build up chinchillas (see “supplement recipe”). But feed no more than 1 teaspoon a few times a week – or otherwise the chinchilla will not eat its staple diet (pellets and hay). Apple or cider vinegar can also be added to the drinking water (10 drops to 250ml water) to help act as a tonic and stimulate the appetite. For further info on all these (and other) subjects you can do a word search using the facility at the top of your screen. I hope that the above is useful. However, it is worth mentioning that although anesthetic techniques have improved enormously in recent years, there is still a small risk whenever a chinchilla requires surgery. However, the above tips may help to prevent some adverse post-operative conditions. Chinchilla Lifespan: How Long Do Chinchillas Live? I rescued Jasper from unbearable living conditions and we have been best buddies ever since! ChinchillaStuff.com is a website where I share things about my Chinchilla as I learn them, and help other chin owners to enjoy their chins even more. We found this “ChinToon” in an old magazine from the 60’s. We would normally give credit to the artist, but we don’t know who that is. If you find any good ChinToons for this page, please let us know.